Reduce breakouts and clear up your skin. Actimine is a natural solution that contains PROVEN ingredients to help you reduce breakouts and clear up your skin. Nearly 17 million Americans are currently experiencing acne, the most common of all skin diseases - affecting 85% of people between the ages of 12 and 24.If you are one of these people, we can help. 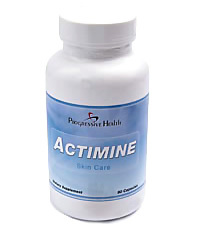 Actimine contains natural ingredients that have been shown to have a positive effect on acne. Clinical trials done on the individual ingredients show that after 6-12 weeks of use, you may begin to notice less oil present in the skin along with a reduction in whiteheads and blackheads. Acne is caused by many complex processes that involve different hormones, enzymes, and immune processes. By helping internal imbalances, Actimine is able to balance natural body functions that are responsible for causing acne. This will reduce the amount of breakouts to help your skin look as clear as possible.